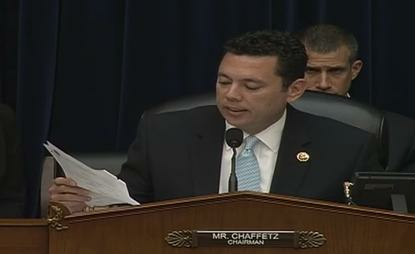 U.S. Representative Jason Chaffetz, a Utah Republican, reads past cybersecurity reports criticizing the U.S. Office of Personnel Management during a congressional hearing on Tuesday, June 16, 2015, about data breaches at the agency. One of the attacks compromised a database containing files of U.S. government workers and job applicants who filled out applications for security clearances, and other governments could use those files to identify federal employees in sensitive positions, members of the U.S. House of Representatives Oversight and Government Reform Committee said during a hearing Tuesday. "This is absolute negligence that puts the lives of Americans at risk," said Rep. Steve Russell, an Oklahoma Republican. OPM officials told lawmakers they were still investigating the breach of the security clearance database and declined to estimate how many people are affected or whether another government was responsible. Agency officials also declined to talk in a public hearing about whether intelligence or military workers were affected by the breach, but lawmakers raised concerns about that possibility. The attack on OPM represents a "far more serious one to the national security of our country" than the Sept. 11, 2001, terrorist attacks, said Carolyn Maloney, a New York Democrat. The breaches appear to be part of a "large-scale cyberspying effort," she added. That breach, announced last week, compromised information on the government's Standard Form 86, a 127-page questionnaire that asks about an applicant's past military experience, criminal background, computer hacking activities, financial problems and links to terrorism groups. The compromise of the SF86 information represents "crown jewels material in terms of potential blackmail," said Representative Ron DeSantis, a Florida Republican. The second breach, announced earlier this month, involves the personnel records of about 4.2 million U.S. government employees. OPM failed to encrypt parts of the worker records stolen in the attacks and declined to shut down outdated systems as recommended by the agency's inspector general, noted Representative Jason Chaffetz, a Utah Republican and committee chairman. After years of IG reports saying OPM's cybersecurity programs represented a "material weakness," the agency still doesn't have a complete inventory of its IT systems, he said. Efforts to improve the agency's cybersecurity "didn't work, so you failed utterly and totally," he told OPM director Katherine Archuleta. Archuleta, who took over as director of OPM in November 2013, told lawmakers she's made cybersecurity a top priority since then. Archuleta has pushed for an "aggressive effort" to update old systems, deploy new firewalls and implement two-factor authentication to gain access to OPM systems, she said. OPM is committed to a "full and complete" investigation of the breaches, and is taking action to close the exposed vulnerabilities, Archuleta said. Asked why she didn't shut down some systems as recommended, Archuleta said some are essential for federal workers to get paid and retirees to get benefits. The agency is working to encrypt data on systems, but it's difficult or impossible on some of the agency's 25- to 30-year-old COBOL-based systems, said Donna Seymour, OPM's CIO. Several committee members harshly criticized Archuleta and other government officials testifying, but the hearing produced little new information about the two data breaches. Archuleta avoided some direct questions, and witnesses referred questions about details of the attacks to a classified briefing with lawmakers later in the day. OPM has withheld information from Congress and federal workers, citing an ongoing investigation into the breaches, said Representative Stephen Lynch, a Massachusetts Democrat. After Archuleta avoided a yes-or-no question about whether social security numbers were encrypted, Lynch urged OPM to release more information. "This is one of those hearings when I think I'm going to know less coming out of the hearing than I did when I walked in, because of the obfuscation and dancing around that we're all doing here," he said. "I wish you were as strenuous and hard-working at keeping information out of the hands of hackers as you are keeping information out of the hands of Congress and federal employees."